IBM expects to generate about $7 billion in cloud revenue by 2015. ARMONK, N.Y. ( TheStreet) -- IBM ( IBM - Get Report) expects to generate around $7 billion from cloud computing by 2015, according to the tech giant's CEO Sam Palmisano. Speaking during the company's annual investor meeting, Palmisano explained that IBM is already involved in "thousands" of cloud engagements with customers such as AT&T ( T - Get Report). "All cloud is is the next technical shift in the enterprise," he said. "It represents about $7 billion of opportunity for us." IBM has made a major push into cloud computing, launching its 'Blue Cloud' strategy in 2007, and the growing popularity of cloud services is expected to drive demand for the company's servers, software and services. 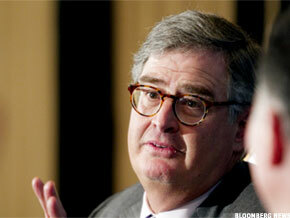 Palmisano also used his keynote to reiterate IBM's commitment to deliver earnings per share of at least $20 by 2015. This, he explained, will partly be the result of selling more software. IBM also expects the revenue contribution from emerging "growth" markets to reach 30% of the firm's geographic sales by 2015, according to a slide shown by the CEO. Previously, IBM had predicted a revenue contribution of 25% from emerging markets, which include India and China. "GDP over the next five years in these emerging markets will outperform the developed world -- I think that is irrefutable at this point in time," he said. "It's the emergence of the middle class and the per-capita income shifts that are occurring." The tech bellwether, which competes with HP ( HPQ - Get Report), Oracle ( ORCL - Get Report) and Microsoft ( MSFT - Get Report), recently posted strong quarterly and annual results, boosted by increases in mainframe, software and services revenue. "It was another record year in a tough economic environment," said Palmisano. "It was our seventh year of gross margin expansion." High-margin offerings such as software and services helped IBM sidestep the worst of the recent recession, and the company expects to almost double its software profit by 2015. The tech bellwether is also looking to return $70 billion in capital to shareholders between 2010 and 2015, according to Palmisano's keynote, as well as adding another $100 billion in fresh cash flow.